While PG&E Corp. and utility subsidiary Pacific Gas and Electric Co. made clear that they intend to seek bankruptcy protection later in January as wildfire liabilities mount, their outlook is hard to pin down because it ultimately may require a political solution with state lawmakers, according to attorneys and analysts with experience in the industry. 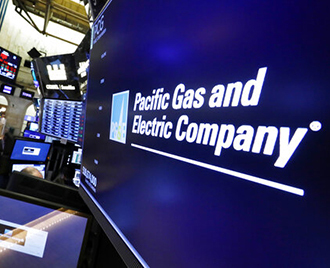 PG&E Corp. stock lost about half of its value when trading opened Jan. 14 after the company announced that it intends to seek bankruptcy protection. "It's different from a host of other companies that have faced challenges," Baker Botts LLP partner C. Luckey McDowell, who focuses on the energy sector, said in an interview. "Other companies say, 'We're going to stop acting badly, we're not going to have these liabilities going forward, and we just need to account for what's happened in the past." Facing billions of dollars in liabilities from recent California wildfires, including the deadliest one in the state's history, PG&E Corp. and the utility on Jan. 14 filed a 15-day notice of intent to seek Chapter 11 reorganization. The only alternative to bankruptcy "falls squarely on the state legislature," analysts at ClearView Energy Partners LLC said in a note to clients. The assembly in 2018 passed a law obliging regulators to apply a "stress test" to cap utility liabilities and pass costs to ratepayers to ensure reliable electricity services, but it enables PG&E Corp. to seek approval from the California Public Utilities Commission only to issue bonds secured with revenues from customer rates to meet 2017 wildfire liabilities. Lawmakers would have to pass a new law providing for 2018 wildfire costs in the next two weeks before PG&E files for reorganization, but Height Capital Markets energy analyst Katie Bays does not see that happening in time, even though there was bipartisan support for the 2018 law. "I think bankruptcy is unavoidable. I don't think legislation has any hope of keeping them out [of it]," she said in an interview. If PG&E Corp. does not broker a deal with California lawmakers before filing for Chapter 11, Baker Botts' McDowell said, it will likely sit in bankruptcy and continue to operate for the next six months or so without revealing its strategy. One potential solution, he added, would be to turn the company's transmission and distribution business, which "was most likely responsible for the fires," into a state-owned entity. There are also segments that PG&E could sell off, including the gas utility and electric generation and retail businesses. "I think there are certain parts of this company that could be purchased where the liabilities would not follow on to the buyer," McDowell said. "It's sort of that middle part." While there is no way to predict what the dollar amount of any settlement might be, electric utilities analysts at Wells Fargo wrote in a Jan. 14 note to clients that "the ultimate wildfire-related liabilities that [PG&E] will incur will be materially less than the headline number of [$30 billion-plus] and less than the [$25 billion-plus] arguably embedded in the share price." PG&E's financial woes in the wake of 2017 and 2018 wildfires prompted multinotch downgrades from credit rating agencies, and stock prices tanked. The company's shares plummeted by nearly half in early morning trading Jan. 14 after the company filed the notice. The shares, which traded near $50 as recently as November 2018, closed at $8.38 on Jan. 14, losing 52% on the day.